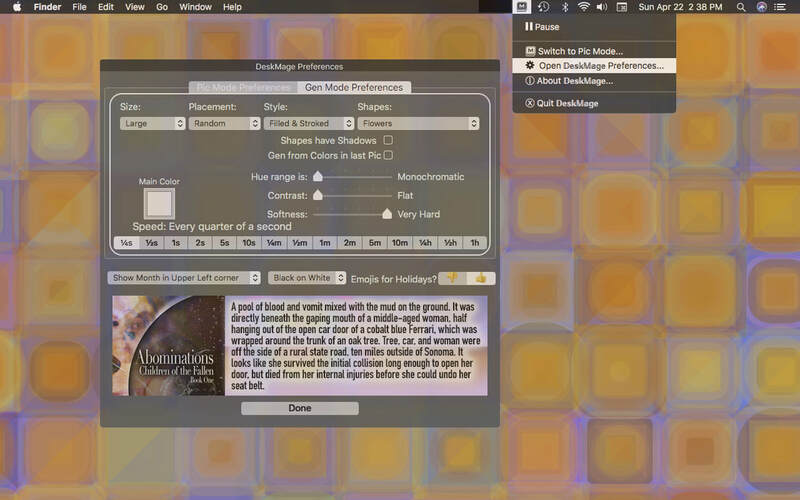 DeskMage is a wonderful desktop enhancement utility that can do so much more than the wallpaper switcher built into MacOS. It has two modes: Pic mode and Gen mode. With Pic Mode, it shows images from a folder of your choosing. Every image in that folder and all of it’s subfolders can be picked for display. No image will be shown twice until every image is shown once. Images are scaled to fit the screen, no mater how large or small they are, or if they are vertical or horizontal. If there would be empty area to the left and right, or top and bottom, that is filled with a tiled version of the image that is highly stylized. You can set the speed the images change in the Settings dialog. DeskMage sits in your menubar for easy access. From it’s menu, you can go to the next image, to the previous image, or to randomly reshuffle the images. This program does not just show you your pics as a slideshow on your desktop, it also lets you curate your collection. If you see an image you no longer like, you can send it to the trash. You can choose to view an image in the Finder to rename it or move it. You can open it in Preview to crop it or adjust the colors. If you have a large image library, you will find this next feature helpful- you can tag the images with a green, yellow or red dot for which ones you like best, medium, or least. These are the same tags Apple uses in Finder, to make it easy to get to those files there as well. In Gen Mode, you don’t need photos. It will generate geometric and organic abstract images using the colors and ranges you specify, to correspond to whatever color scheme you wish. They can be subtle, making it easy to read the icons on your desktop, or they can be bold and colorful. 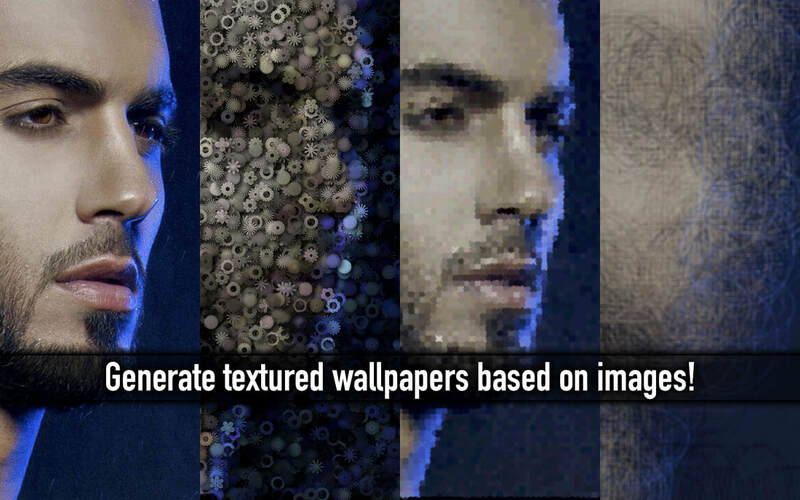 ​The images can even change very quickly, like a screensaver on your desktop. The Gen mode can even use the last shown Pic from the Pic Mode to select it’s colors, resulting in a version of the Pic with a mosaic-like effect. To get the best results, go to Pic Mode, find a very colorful picture and set it as your desktop image. In the Gen Mode Preferences, select small or tiny shapes, and the speed should be relatively fast. The shapes can be any of the ones that get modified by the size and placement selections. Make sure "Gen from colors in last Pic" is checked on. Then, from the menu go to Gen Mode.